That's what we say to our waiters when we aren't ordering a beverage, right? Have you ever been served water at a restaurant and realize it tastes so bad you might have to order a beverage after all? Sometimes I think restaurants refrain from using water filters for that very purpose! Anyway, that's not really the point of this article, but I wanted to bring you to a realization that tap water isn't always very drinkable. Now, assuming you're a reader from the US where most drinking water is supplied through public systems, you've probably had this experience. Water can carry many components that create poor taste and odor, as well as not-so-detectable ones, that may have some harmful effects. Since 70% of our bodies are made up of water, and we can only survive without it a few short days, isn't it essential to make sure the water you drink is as clean as possible? This article is going to give you a general overview of the challenges we face with our drinking water quality. First of all, where does water come from? Is it limitless and renewable? We have usable access to less than 1% of all the earth's water. 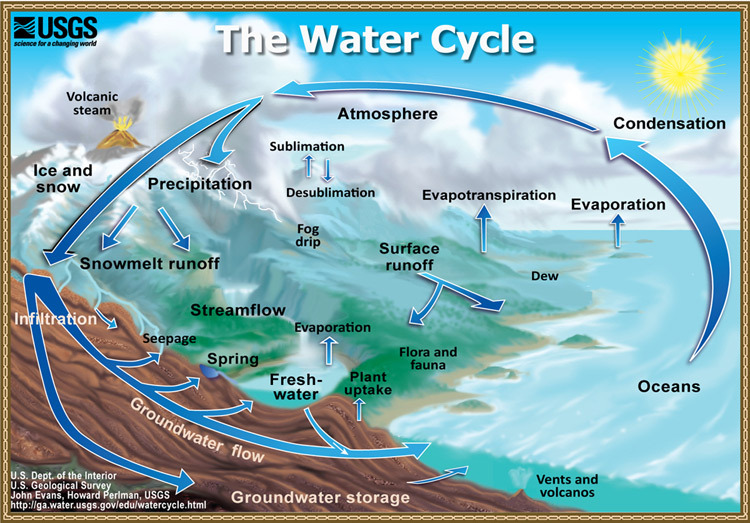 Water goes through a natural process of evaporation from ground sources, into the atmosphere and back. That's over-simplification, but most of us know our water resources get low when we haven't had enough rainfall. As water concentrates in lakes, rivers and waterways and underground, it can carry contamination from many sources. Chemicals, heavy metals, human and animal waste, mining and factory discharge, and living organisms such as bacteria and parasites are commonly found in the earth's water. Let's take a look at this in relation to our use of the water and our health. From the beginning of history, one of man's biggest threats has been biologically contaminated drinking water causing disease and death for millions. In first-world countries we have overcome that danger with various disinfection processes, the most common being the use of chlorine. Now, you may not know chlorine itself is dangerous to our health and linked to cancers, but it has become a "necessary evil" in our modern world. Since most public treatment systems use chlorine and the water often comes from surface water sources such as lakes and rivers, the chlorine mixes with organics in the water and creates what is called "disinfection by-products". These are a host of chemicals that can cause even more illness and cancer. One of the primary chemicals from disinfection is called Trihalomethanes. Just this week in our region of North Carolina they reported elevated levels of this in our drinking water. Toxic chemicals in drinking water are becoming so common now that public awareness is beginning to increase. Another big chemical threat is the many pharmaceuticals that get dumped into our water supplies. How does this happen? Did you ever flush an expired drug prescription down the toilet? How about the instances where illegal drugs are flushed during a drug raid? Narcotics, contraceptives, hormones, antibiotics, anti-depressants, you name it, it's probably ended up in a water source near you. And, don't forget, any drugs you take can leave your body with your waste and flush into the sewer on a daily basis. You must be saying to yourself by now, HOW does that have anything to do with drinking water? Well, brace yourself! MANY of our municipal water treatment centers are downstream from sewer treatment centers. In our area we have sewer plants discharging water into the same lakes and river system that our water treatment plants are drawing the water supply from. The term "toilet to tap" is getting very real in many areas of the country. In fact, California is already converting sewage to drinking water in the midst of severe drought. Our public water treatment systems are often aging, as are the miles of water supply lines snaking through urban areas, sometimes laying within the same trenches as the sewer lines. So, even if the treatment plant succeeded in removing all targeted contaminants (except, of course, the disinfecting chemicals and added fluoride), you have no guarantee that what comes out of your faucet is safe. Well water users are also vulnerable to the many ground water pollutants that can travel from miles around through underground aquifers to reach and contaminate private or community wells. Gasoline products leaking from storage tanks, toxic chemical dumping and farming chemicals are just a few ways your well water could be compromised. Microbial contaminants are also a primary concern in well water as are heavy metals such as lead and arsenic. So, where does that leave you and your options for healthier water? You may be one of the millions that regularly purchase bottled water, thinking it's better than your tap water. Well, maybe not! Many bottled waters are simply bottled tap water with no filtering or treatment process. Others use some form of treatment, but storing water in a plastic bottle can leach chemicals from the bottle, especially in warmer temperatures. The bottles themselves have become a landfill issue, even heavily polluting our lakes and streams. 1) Is your water from a city source, community well or private well? 2) Have you had a water test to screen for specific contaminants or do you have a water report from your municipal services? You can request this if you have a public water supply and some areas offer free testing. Remember, though, you may not get a comprehensive test that shows all the varied contaminants, so be careful. There are testing options from simple and limited home kits starting at around $20 to full analysis at nationally certified labs at upwards of $300. Understanding your water quality is a valuable tool in deciding what water treatment system is going to serve your needs. Filtration options are varied from simple carbon refrigerator or pitcher-type filters to multi-stage processes either at one tap or on the whole house. Added media beyond carbon can help reduce some chemicals and metals that carbon can't remove, such as fluoride. Disinfecting is an added component for well water that could be infected with e-coli or other disease-causing microbes. Point of use options also include water ionizers or alkalizers, which are gaining popularity in the US. You can find water quality consultants who are trained to guide you through the process of water analysis and treatment options. Be aware though, some professionals are not without bias and may be sales reps for specific water treatment systems. If you'd like to participate in our NORMI National Water Screening Project short survey, it will allow you to request valuable free phone consultation with the author of this article. Linda Eicher is an Indoor Environmental Health Professional specializing in assessing indoor air quality, water quality and mold since 1995. She is the CEO of Environmental Services Group Carolinas, LLC. Linda also serves as the National Training Director for Best Training School, a training provider for environmental professionals, NORMI certifications and state mold licensing requirements.